Tabung Haji is believed to be the buyer of a multi-storey tower in the heart of Kuala Lumpur that will be built by Naza TTDI Sdn Bhd. A source said that Tabung Haji had purchased the 30-storey building, located at the RM4.1 billion integrated upmarket commercial and residential property project known as Platinum Park. It would be the second property in the project that Naza TTDI has sold, after last year's RM640.7 million deal with plantation group Felda for a 50-storey tower. "I don't know whether Tabung Haji will move its headquarters to the new building or whether it bought for investment purposes," the source told Business Times. Tabung Haji has declined to comment. In an interview with Business Times recently, Naza TTDI group managing director SM Faliq SM Nasamuddin said that a 30-storey building had been sold to a government-linked company. He did not reveal the buyer. "This tower together with two other towers is scheduled for completion within five years," the source said. Naza Group of Companies joint executive chairman SM Nasarudin SM Nasimuddin, when met at a function in Kuala Lumpur yesterday, declined to reveal the buyer of the third tower at Platinum Park. "It has already been sold, but I am not about to reveal who the buyer is," he said after witnessing the signing of an agreement between Naza Group and Well Spring Inc in Kuala Lumpur. Naza has been given a master licence by the US-based company to operate "Tutti Frutti" frozen yogurt outlets in the country. Work has started on the Felda building as well as the 50-storey building which will house Naza Group's headquarters. 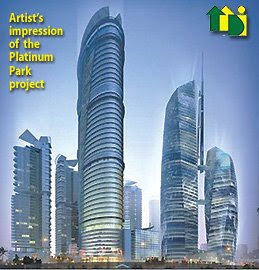 Platinum Park, developed by Naza TTDI, is in the vicinity of the Petronas Twin Towers and the Suria KLCC shopping centre. It is set to be the single largest luxury project undertaken by a Bumiputera company in the heart of Kuala Lumpur. There will be seven buildings at Platinum Park. Naza TTDI is the property arm of the Naza group. Founded by the late Tan Sri Nasimuddin SM Amin, the group was better known as a motoring company before it bought over TTDI from Danaharta in 2004. CONSTRUCTION company Bina Goodyear Bhd expects to win two contracts, worth as much as RM800 million in total, within the next six months. The company, which reported RM15 million net loss in the nine months to March 31 2009, is optimistic of returning to profitability next year, helped by lower material prices. "We believe prices of most things have stabilised. It may go up by 5-10 per cent. But once it stabilises, it's easier for us to move on," senior general manager Lawrence Lau told reporters after the company's extraordinary general meeting (EGM) in Subang, Selangor, yesterday. Bina Goodyear currently has orders of about RM750 million, which will keep it busy for the next six to nine months. "Most of the jobs will be completing soon. In our business, each job usually takes about 24 months," Lau said. During the EGM, shareholders approved the company's plans to sell a piece of land in Bandar Sri Damansara, Selangor, for RM27 million. The sale is to fund working capital and cut debt. The company has some RM100 million in borrowings. However, it said it was not too concerned over its borrowings. "Most of our borrowings, more than 50 per cent, are borrowings for construction jobs. This means we will be able to settle the loans as soon as the project is completed," said Lau. The company has no plans as yet to venture outside the country. SHAH ALAM: Bina Goodyear Bhd will use about RM9mil of the RM27mil to be raised from the sale of its 8.6-acre land in Bandar Sri Damansara to part-pay borrowings which stand at about RM100mil currently. Senior general manager Lawrence Lau said the land disposal and cancellation of its proposed development project were part of the company’s plan to consolidate its non-income-generating assets. “We believe the market is not good enough for the kind of development we were looking at. At such a time it could be a bit tough to have good take-up rate,” he said after the company EGM yesterday. Shareholders yesterday approved the proposed sale to Green Heights Developments Sdn Bhd for RM27mil. Bina Goodyear had earlier proposed a residential development comprising three bungalows with a sales value of RM2mil to RM2.5mil each, and 46 semi-detached bungalows at RM1.3mil to RM1.6mil each. Due to the softening property market, Lau believed it was pointless to proceed with the project only to hold on to it later on. “We believe the proceeds from the land sale can be more efficiently utilised,” Lau said, noting that the proposed disposal was expected to be completed by the third quarter of this year. Of the proceeds, about RM16.5mil will be used for working capital. Shareholders’ approval for the proposed development had also lapsed some time ago, said Lau. Meanwhile, the group was optimistic of returning to the black in the financial year ending June 30, 2010. “We believe prices of raw materials will stabilise and this will be the major basis for our turnaround,” said Lau. To date, its order book of on-going local construction jobs is valued at RM750mil, of which 40% to 50% has been completed. This will keep the group busy for another six to nine months. “We expect to secure one or two projects, mainly construction jobs, within the next six months,” Lau said, adding that the group was bidding for jobs worth RM50mil to RM300mil. Bina Goodyear posted a net loss of RM4.7mil on revenue of RM91.3mil for the third quarter ended March 31. TAIPEI: Officials in an outlying Taiwan archipelago said yesterday they would build a massive resort-casino with investment of at least US$910 million (US$1 = RM3.55) if local voters approve a gambling referendum as early as next month. The Penghu County government has proposed its casino resort on 130 coastal hectares with hotels, duty-free shops, a convention centre and a golf course, said Liu Mei-fan with the county’s tourism bureau, which would concession out the land.